I can honestly say this has been a week like no other. This is the week my mother died. Just writing that feels like a punch in the gut. In February at the time of her birthday ( and mine) she fell ill with flu and although she tried her hardest she couldn't overcome its effects. After 5 weeks she slept peacefully away with my sister and I by her side. That's a huge comfort in the midst of our grief. She was 89 on the birthday we never got to celebrate. A good long life that had been free from illness until Alzheimer's robbed her memories but not her character. 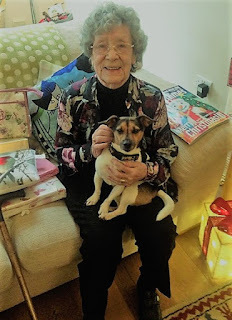 Even when she found comfort and safety moving to a care home, she was valued there for her quick brain ( the domino and quiz maestro) as well as her quick wit. I described her as the queen of the cashmere cardigan and the one liner and she carried both off well. We plan a good celebration of her life and will toast her with her preferred tipple of a wee jungle juice ( don't ask!). It's been a strange week when I've at times wanted to pull the covers over my head. Also I've engaged with work which was mostly a welcome distraction from the deep sadness that has moved in not just to my emotions but somehow I can feel it in my body too. I say mostly because I recognised that however distracting it is, there is a lens I'm seeing the work through just now and sometimes the clarity it brings triggers unexpected emotions. On one occasion it was anger so encompassing I couldn't hold back. It was a discussion on a familiar refrain just now, the changing demographic to an aging population who are a burden for our services. The word burden was my trigger. I pointed out- maybe a bit sharply to be honest- that there was a need for this language of burden to be changed. And this is a message for our media as well as leaders of public services -maybe even to ourselves ? Of course it was my own Mum who came to mind. She had had one day in hospital since my sister and I were born and every part of the social care she received to support her, as Alzheimer's left her more vulnerable, she paid for herself out of very hard earned savings. She brought us up, supported care of her grandchildren too when she could, she worked, she paid taxes and national insurance and she was NOT a burden to health or social care services ever. On the other hand I've had breast cancer three times in my life, had lots of surgery, medication, radiotherapy -the works. I've survived the first diagnosis of breast cancer for over 20 years, long enough for it to come back. Years ago that would not have happened, so maybe that makes me more of a burden than anyone? But wait cancer survivors are heroes aren't they? Maybe it's just as we're deemed old we can be described as burdens? Much of my work is focused on transforming health and social care services and to help make them fit for the future. My urgent ask of us all is we stop referring to people as burdens and start seeing that they are just you and me, doing our best, paying our dues and worthy of the care we would all wish for ourselves and those we love, whoever they are, and however old they are. We will never change the culture of care if we don't change the language, and we must start by banishing the word burden. And final word will be with my Mum who had a habit of ironically using the phrase "I'm not a bit of bother" which usually resulted in a rolling of the eyes, often mine if I'm honest! But do you know what when it comes to her needs being met by society she really wasn't a bit of bother and she's not alone in that. She was a Sister, a Friend, an Aunty, a Wife, a Daughter, a Nana, a Great-Grandma,a Mother-in-law and a Mum and not a bit of bother, nor indeed a burden.